The Briggs-Staub House, at 2605 Pryrtania Street, broke from Garden District tradition with its Gothic Revival style when it was built for gambler Cuthbert Bulitt in 1849. 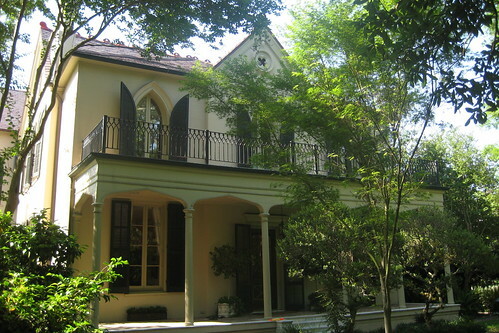 To this date, it is the neighborhood's only house in that style. Garden District Protestant Americans typically shunned Gothic Revival architecture because it reminded them of the Roman Catholicism of their Creole antagonists. After architect James Gallier, Jr. completed the house, Bulitt refused to pay for it--popular belief has it because of a large gambling loss, and the house was subsequently sold to Charles Briggs, an English insurance executive. Briggs lived in the house at the time of the area's Irish immigration and, rather than hold African slaves, hired Irish servants, for whom he built the relatively large adjacent matching servant quarters. The interior departs from a strict Gothic breakup of rooms, making it better suited for entertaining, but Gothic detailing is prevalent both inside and out.